The mediaeval town of of Carcassonne is an even more superb experience than the usual French mediaeval experience and many Irish visitors have discovered it due to the great flight connections to Carcassonne Airport itself, as well as through Toulouse with Aer Lingus. There are three main markets here in an area renowned for the dominance of duck but also for the presence of so many other wonderful foods in the warm south-eastern corner of the country. 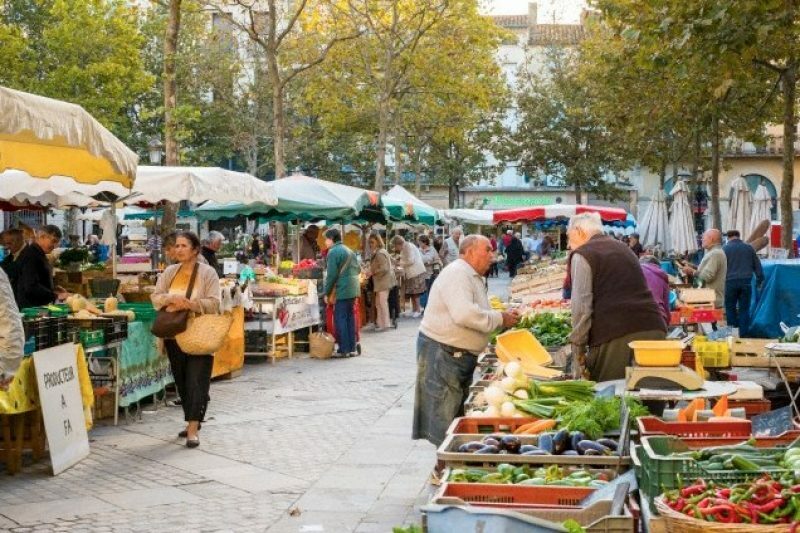 The Flower, Fruit and Vegetable Market (Marché aux fleurs, fruits et légumes) takes place on Place Carnot (pic above) in the centre of the grid-patterned 19th-century city (la Bastide) every Tuesday, Wednesday and Saturday morning from 07:00 to 13:00. It’s a colourful affair pretty much all year round with fresh food, fruits, flowers and veg. The covered market is used runs every day from Tuesday to Saturday 07:30 to 13:30 on the corner of Rue du Dr Albert Tomey and Rue Aime Ramond, selling a mouth-watering selection of fresh regional produce; butchers, charcuterie, fish-mongers, market gardeners, fowl, smoked meats… it’s all here in a noisy atmosphere under an atmospheric roof. The Flea Market and Clothing Market is a Saturday event from 07:00 to 12:30 (or later in the summer) along the Boulevard Barbès.